Four Charter Members of the Chorale were honored at the concerts on March 11 and 12. From left: Lillian Rossetti, Jackie Lottermoser, Sandy Aylesworth and Peter Dwyer, all of Oneida, have been singing with the group since its inception in 1967. Bernadette VanValkenburg, of Sherrrill, first from right, was also honored for being the group’s first accompanist, when she was still a high school student. She has been Chorale accompanist for the past 22 years. 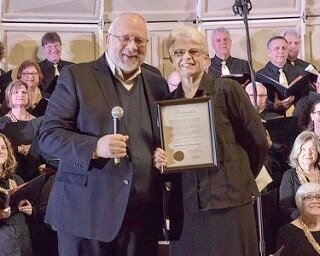 Oneida Mayor Leo Matzke proclaimed March 11 and 12, 2017 to be “Oneida Area Civic Chorale Days” in the City of Oneida, and urged all citizens “to share in the joy of singing by community involvement in the choral arts. Matzke attended the concerts at the Kallet Civic Center and made the proclamation in honor of the group’s 50th Anniversary Season. The Chorale was founded in 1967 by Daryl Wonderly and a small group of singers from St. John’s Episcopal Church, and has been performing continually throughout the area. Kimberly Nethaway of Rome has been Chorale Director for the past 22 years. Matzke is pictured presenting the proclamation to Chorale President Patricia Albaugh of Oneida. Like us on Facebook and check each Thursday for pictures that go with the Fun Facts. 50TH ANNIVERSARY FUN FACT: The OACC got its start in the fall of 1967, when a group of St. John’s Episcopal Church of Oneida choir members asked their director, Daryl Wonderly, to lead a community chorus. He agreed, and in December of that year he and 25 singers prepared a tape of Christmas music to be played on local radio station WMCR. 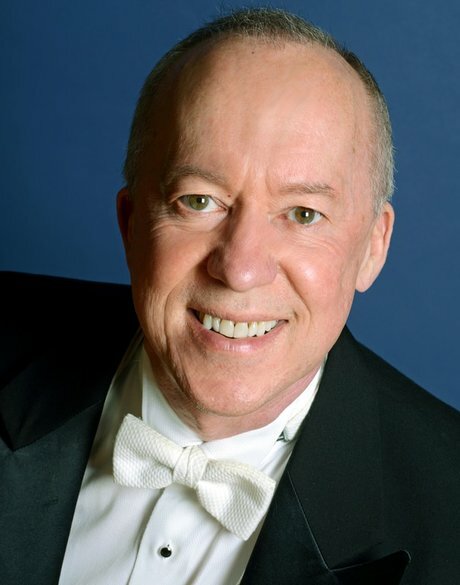 In May, 1968, he conducted 42 singers in the OACC’s first concert. Wonderly continued as Director until 1995. He was also a vocal music instructor with the Oneida City School District, and now lives in Arizona. 50TH ANNIVERSARY FUN FACT: The first Chorale Concert was presented on May 8, 1968 at Oneida High School. The program included "classical works as well as music from a Broadway hit", according to the Oneida Democratic Union newspaper. It was conducted by Mr. Daryl Wonderly and accompanied by Miss Bernadette Desnoyers, a 17-year old high school student who grew up to be our own Bernadette VanValkenburg. Bernadette became a full-time OACC accompanist in 1995 and has continued at that post to the present time. 50TH ANNIVERSARY FUN FACT: On December 11, 1970, the OACC presented a free concert at Oneida High School. The concert was sponsored by the Cochran Memorial Presbyterian Church of Oneida Castle, and featured "Fanfare for Christmas Day", "Jesu, Joy of Man's Desiring" and selections from "Messiah". Daryl Wonderly conducted and the accompanist was Charles Rasely. 50TH ANNIVERSARY FUN FACT: The Chorale used to have sub-groups, such as Dancers, Men's Quartet, and the Women's Sextet, pictured here in an article about the May, 1972, Spring Concert. You should be able to read the article if you click on it. Note the ticket price: $1.00. 50TH ANNIVERSARY FUN FACT: Back in the day, the Chorale often incorporated dance routines in their pops concerts, as in the May 30, 1979 cabaret-style concert at the Oneida Moose Lodge. After the concert, the Syracuse Symphony Orchestra provided music for dancing! Notice the lovely gowns worn by the ladies. 50TH ANNIVERSARY FUN FACT: The Chorale has an Annual Banquet, held in a relatively local facility. Here are pics from the May, 1973 affair that was held at Joel's Steakhouse in Verona, with its legendary carousel. Joel's is no longer with us, but Don and Jackie continue to sing with the Chorale, as did Loyal until very recently. 50TH ANNIVERSARY FUN FACT: The May 11, 1974, "Seventh Annual Concert" featured a segment from Mendelssohn's "Elijah", several Robert Frost poems set to music in "Frostiana", as well as some pop songs that will be performed at our March concert: "Georgy Girl", "Bridge Over Troubled Water", and "Moon River". The concert also featured the debut of the "new spring sashes". 50TH ANNIVERSARY FUN FACT: Have piano will travel! In the spring of 1975, the OACC took to the road and took a piano with them!! Check out the upright right out in the amphitheater classroom at the Rogers Conservation Center in Sherburne, NY, and outside the Oneida Municipal Building for a Flag Day concert on June 14, 1975! We are lucky these days to have a Chorale keyboard and very long extension cords! 50TH ANNIVERSARY FUN FACT: On February 28, 1976, the Chorale performed their first commissioned work, "War Poems of Walt Whitman", by Thomas Mirante. Tom Mirante, of Canastota, taught instrumental music in the Oneida district from 1960 into the '90s. 130 Chorale singers and the Syracuse University Symphony Orchestra performed Mirante's composition. The Chorale has commissioned several more works in their 50 year history, by composers such as Syracuse native Amy Bernon, Alfred Fedak of Albany, and Samuel Pellman of Clinton. 50TH ANNIVERSARY FUN FACT: On December 11, 1977, the OACC presented its 10th Annual Christmas Concert at Oneida High School. The concert included traditional carols as well as Vivaldi's "Gloria". It was conducted by Daryl Wonderly, accompanied by Charles Rasely on harpsichord and a Syracuse Symphony chamber orchestra, and featured soloists Carol Dwyer, Margaret Rasely, and Robin Cline. As in pic below, for several years the Oneida Music Company, corner of Main and Madison Streets, displayed full-scale advertisements for Chorale concerts! Carole Valesky, pictured below, continues to sing with the Chorale. 50th ANNIVERSARY FUN FACT: On June 9 and 10, 1978, the OACC presented Pops Concerts at the Moose Lodge (formerly Oneida Country Club) in Oneida, a favorite venue of that era. A few of those pictured continue to be extremely involved in Chorale...you may have to study the names because the pics may not be an instant giveaway! 50TH ANNIVERSARY FUN FACT: The OACC has always been versatile: March 15, 1980 saw a concert centered on folk music with guest band Headin' South and several soloists...check out former Oneida Mayor Max Smith, and Don White, who continues to sing with the Chorale. The 1980 banquet was held at Casa Mia in Canastota...pictured are some long-time Chorale singers who are no longer with us.